What is the role of a facilitator in an organization in Malaysia? A good facilitator is the one who plans, guides and manages a team event in order to make sure that the team’s objectives are achieved effectively, with clear thinking, full involvement and complete buy-in from every person who is concerned. A facilitator must possess excellent facilitation skills to create better, timelier decisions, promote fairness, and to manage meetings and planning sessions for timely and productive outcomes. Hence, if you are a team leader who is accountable for guiding a team then this dynamic course is for you! 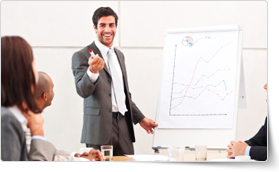 This Facilitation Skills training course from PD Training teaches practical techniques to enhance your facilitation abilities, so that the team can accomplish a victorious decision, resolution or conclusion. This course is available now in Kuala Lumpur and throughout Malaysia. This Facilitation Skills training course can be delivered at your premises by one of our expert local or international trainers or live online using our HIVE technology. Click on the Group Training Quote button, or contact us today for a free personalized quote! Kelli was an excellent presenter/trainer- very knowledgeable and also made the training interesting and enjoyable. I learnt quite a lot through the training and felt very encouraged by Kelli, who was very helpful. I will definitely be passing on good feedback to my organization and contacts. I liked the structure of the course. Wasn't too formal. Feel very grateful to have had the opportunity to have one on one training with Rini who was very knowledgeable, and thorough in meeting my specific needs. Facilitation is often referred to as the new cornerstone of management philosophy. With its focus on fairness, and creating easy decision making, proper facilitation can help any organization in Malaysia to make better decisions and create better environments for staff creativity and productivity. Learn key skills like what is the role of a facilitator, the difference between process and content, effective tools that can be used, bringing the group to a consensus and much more. This Facilitation training course will give participants an understanding of what facilitation is all about, as well as some tools that they can use to facilitate small meetings, training courses or brainstorming sessions and team building events.